Inguinal hernia surgery can be done by laparoscopy (keyhole surgery) or by open surgery. In open surgery, a long incision is made directly over the hernia. All the layers of abdominal wall over the hernia have to be cut in order to reach the hernia. Keyhole surgery is done by making three very small cuts, away from the hernia. An operating camera and instruments are passed through these cuts. A mesh is used to reinforce the muscles of the groin in both types of operation. How is a inguinal hernia surgery done by laparoscopy? Mr Sarela uses the laparoscopic Totally Extra-Peritoneal (TEP) method for groin hernia surgery. The operation is under general anaesthesia and usually takes about 30-45 minutes. One cut (about one-inch long) is made next to the belly button and two smaller cuts (about one-quarter of an inch) are made lower down in the midline of the tummy. The operating camera and instruments are passed through these cuts. The operation is done entirely within your abdominal (tummy) wall. The inside of your abdomen (called the peritoneal cavity) is not entered. The operation has two main parts: (1) The contents of the hernia, along with their covering (called the hernia sac), are separated from the tissues of the groin and placed back into their normal position. (2) A mesh is placed to reinforce the muscles. The mesh is held in place by the contour of the groin. With time, the mesh is incorporated permanently into the abdominal wall. The keyhole cuts are closed with dissolvable stitches. The operation is done usually as a day-case procedure. Laparoscopy is the preferred method of hernia surgery for recurrence after an open operation. Keyhole surgery avoids cutting through scar tissue over the hernia from the previous open operation. The laparoscopy cuts are made away from the area of scarring and the instruments are passed behind the tummy wall to reach the hernia. Can keyhole surgery be done if I have hernias in both groins? This condition is called bilateral hernias. Laparoscopy is the preferred method of bilateral hernias because both sides can be simultaneously repaired through the same keyhole incisions. Unlike open surgery, separate cuts do not have to be made in each groin. Because the cuts for laparoscopic surgery are placed in the midline of the tummy wall, an operation on both groins can be done without making any extra cuts. Two separate meshes are placed, one in each groin. 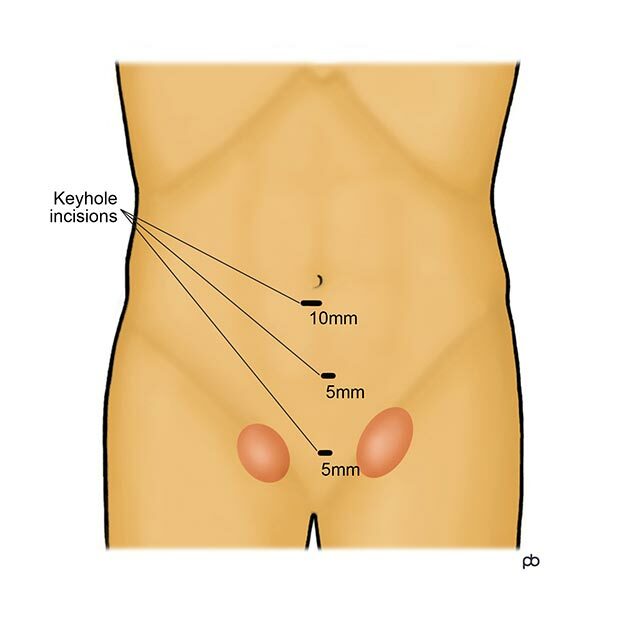 Are there any complications from a keyhole inguinal hernia operation? Like most operations, there are small risks of bleeding and infection. Some men can have difficulty to pass urine after the operation, and require a catheter. Fluids can collect in the space that was occupied by the hernia and produce a painless swelling. This is called a seroma. Almost always, seromas settle down with any treatment. There is a small risk that the hernia can come back (recurrence). Broadly, the risk is 1-2%. Also, it is important to be aware that you can develop chronic pain and numbness in the groin and front of the thigh. Chronic means that the symptoms last for longer than 3 months, and can persist for many years or even life-long. The risk of chronic groin pain seems to be higher for younger people and with hernias that are painful. Very broadly, the risk of moderately severe or severe pain is about 10%. A rare complication is injury to the blood supply of the testicle, leading to swelling or shrinkage of the testicle. 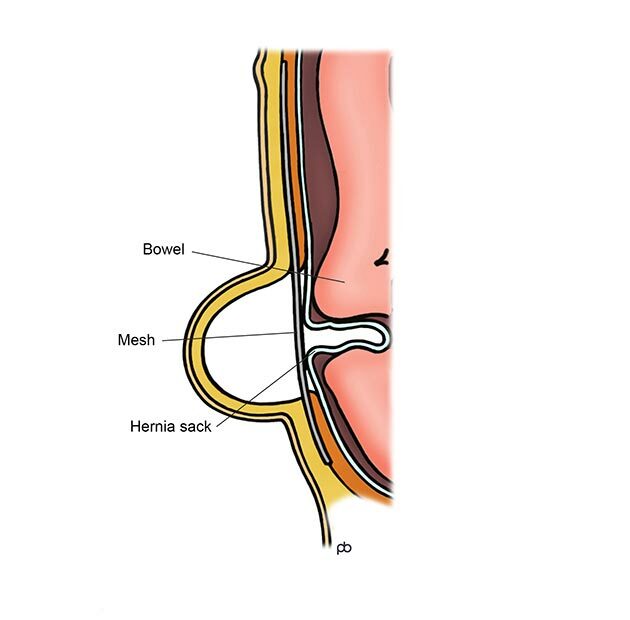 With bilateral (both sides) hernia operations, there is a very small risk of infertility because the spermatic tubes (vas) can get blocked due to scarring around the mesh. How is an open inguinal hernia surgery done? 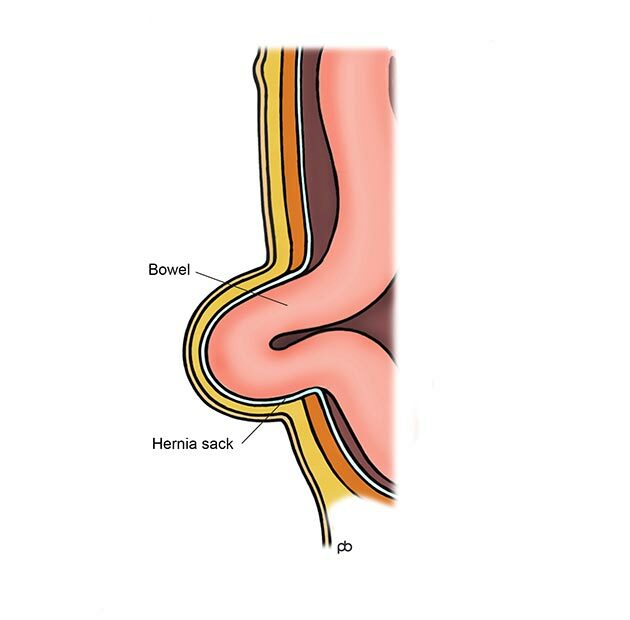 Open inguinal hernia surgery can be done under general anaesthesia or local anaesthesia. It takes about 30-45 minutes. A long incision is made over the hernia. The skin, fat and fascia of the tummy wall are cut in order to reach the hernia. 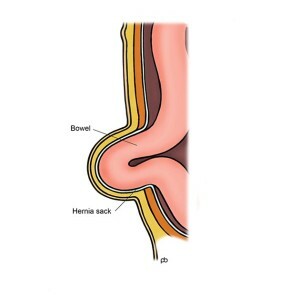 The coverings of the hernia (called the hernia sack) are separated from the spermatic cord (in men) or the round ligament of the uterus (in women). The sac maybe removed or replaced back into the tummy. A mesh is placed over the muscles, and is fixed to the muscles by stitching. Most patients are able to go home on the day of the operation itself. Very occasionally, overnight stay in hospital may be needed. Are there any complications from an open inguinal hernia operation? The complications of open inguinal hernia repair surgery are similar to those of keyhole surgery. But, open surgery can be more painful and your recovery may be slower than with keyhole surgery. Also, the risks for chronic groin pain and numbness are greater after open surgery than with keyhole surgery. Should I have keyhole surgery or open surgery? Mr Sarela recommends keyhole (laparoscopy) surgery for most people. He uses the Totally Extra-Peritoneal method (called TEP). The TEP method of keyhole surgery has several advantages over open surgery. There is less pain and recovery is quick. Also, the risk of chronic groin pain is lower after keyhole surgery than with open surgery. But, keyhole surgery requires general anaesthesia. If you have high risks from general anaesthesia because of other medical problems, then it might be better to do an open operation under local anaesthesia. Also, open surgery may be preferred for very large or irreducible hernias. What is femoral hernia surgery? Femoral hernia operations can be done by keyhole surgery or by open surgery. The femoral hernia operations are very similar to operations for inguinal hernias. Mr Sarela recommends the laparoscopic TEP method of surgery for femoral hernias. Is there any restriction on activity after hernia repair surgery? Most people are able to resume their day-to-day activities within few days after surgery. Some people will recover quicker, and others may take longer. It is best to avoid strenuous physical activity, like lifting heavy weights, for 2-3 weeks after the operation. There is no hard and fast restriction on physical activity. It is mainly common sense. Do only what you feel you are able to do, and avoid activities that cause discomfort or a feeling of strain in the area of the operation.